The fire at the Crude Distillation Unit (CDU) in Kerteh, Kemaman which was under maintenance and restoration, was put out in 15 minutes by a Petronas Security team. plant were injured in a fire at about 5pm yesterday. Petronas East Coast Region manager, Zulkifly Mohd Ismail said the fire occurred suddenly when a group of contract workers were carrying out maintenance work at the plant. He said two of the injured workers, Mohd Ayub Abdullah, 22, and Mohd Zakaria And Ghani, 28, suffered burns on the face and hands and were sent to the Sultanah Nur Zahirah Hospital for treatment. "The injuries were not serious, I have visited them this morning and they are in stable condition. They could be discharged in two to three days," he told reporters here today. He said two other contract workers whose identity have not been confirmed suffered light injuries and were treated at the Dungun District Hospital. Zulkifly said an investigation into the cause of the fire was still in progress and that the fire did not cause any damage to the main plant. 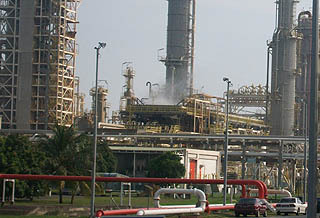 He said Petronas would be further improving its plant safety to avoid such incident from recurring. "Our effort on safety is continuous process as we do not want anybody to be injured," he said.